Isn't that just beautiful? Most people don't seem to realize that Israel is on the Mediterranean, and being that the Mediterranean bears ethereal magnificence, Israel is graced with some of the most breathtaking beaches around. Yes, yes, the Caribbean and Thailand are great, but if you walk three minutes from an Israeli Mediterranean beach, well, you're walking on some Biblical site, in some Biblical town, by some Biblical characters and their homes. 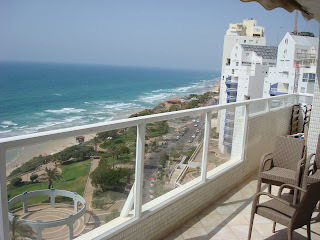 What you're looking at in the picture is a view from a balcony overlooking some of the beaches in Netanya. Netanya is slightly north of Tel Aviv, obviously on the coast, and it's well known for having the Ikea store. That and the best coastline in Israel, at least according to me. Not only do kids surf there, but it's also a hot destination for riding horses on the sand. Considering its physical qualities, the foreigners have moved in en-masse. Land values in Israel are on the rise, astronomically, in no small part due to the rise in foreign-owned property. Rich Americans, Canadians, Brits, and French are notorious for buying up apartments, old Turkish houses, and land in areas like Baka and Katamon in Jerusalem (the German Colony). These neighborhoods are literally the Little Americas of Israel. You can walk down the street in Katamon and hear Hebrew, but if you walk by a school in the morning, I can guarantee you you'll hear a mother or father talking to a kid or two in English. If you get on the number 18 bus on Emek Refaim and don't hear some English, you might want to make sure you didn't have a concussion and wandered somewhere else. Those communities in Jerusalem are so Americanized, or owned by non-native Israelis, because they are gorgeous locations. Emek Refaim and the surrounding Baka/Katamon neighborhoods were expensive areas in the time of the Turks, and they haven't ceased to be the most desirous since. An example? When the German Templars (a Christian sect that owned this area) were evicted after WW2 by the British because of their support of Nazi Germany, where do you think the British officers lived? Yup, they squatted on the houses in Baka, Katamon, and on Emek Refaim. How nice are they? You can't buy a place for less than a million, and that's probably a junky attic. 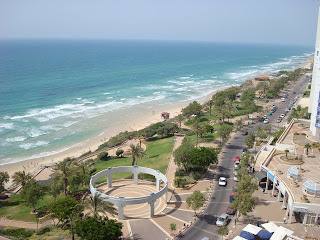 I went to Netanya for the first weekend of Passover (Pesach). I have a good friend whose step-father is a Brit, and besides owning a nice apartment in, you guessed it, Katamon, they have a place in a community in Netanya actually not known as Little America, but rather as Little England. On the way to synagogue one morning, I ran into a random British guy, and he asked me where I was going to daven. I told him "Young Israel," the synagogue that my host goes to. The guy looked at me, chuckled, and like a good Brit he came back with some biting wit. "Yeah, more like Old England." The synagogue is populated by a bunch of old guys. I guess it takes a lifetime of income to afford one of these places. It seems strange to me that there are definitively American places, and as if there is any need to further subcategorize Western, non-native Israeli areas, there's also those definitively British and French spots as well. That's one aspect to the whole 'Israel as the center of Judaism,' where Jews from all over the world come here to live or play. You don't think of this country as being large and diverse enough to merit definitively foreign clusters, but humans are humans, and we tend to group ourselves as we find most comfortable. That being said, most of that "foreign" business is American. In Jerusalem, in general, if you see an Indo-European text on a sign, it's probably in English. However, if you are walking on Rechov Nice (a street) in Netanya, those signs are going to be in French. At first I unwittingly laughed at the stupid Israelis, putting "cacher" instead of "kosher" on a restaurant ad. Use a spell check! But, remember the street name, Danny! It's not Nice as in "nice to meet you," but rather Nice, the French Riviera resort city. At least in Jerusalem they name the streets in Hebrew! Usually. We had our Pessach seder at my friend's step-father's apartment, which is right on the beach, and has a view of the ocean. I've been here before, and I was anxiously awaiting going back to see that terrific seascape again. I was unaware, however, at how many people were going to be there. After I found out that about 16 bodies were going to be staying at the apartment, eight of which were girls under the age of seven, I got a little nervous. Then my friend, her brother, and her sister and I went over to their friend's apartment. This family happens to be doing Passover in Italy, if you get where I'm going with this. I've known all these people for a while now, but I guess I'm always a little taken aback when I see their places. Let's just say I'm constantly plagued by the worst of the deadly sins. Just passed by to thank for the link!